Many people are confused when it comes to investing in a property in Kerala like an apartment flat or villa. Their doubt is whether it is better to put money in Bank Fixed Deposit or in shares or buy a flat in Kerala. We will discuss below the various options: buy a flat in Kochi Kerala's commercial capital, or put the money in bank fixed deposit, or invest in share or stock market. Let us investigate the case of investing in a property in Kochi Kerala. Kochi is the booming commercial capital of Kerala and the property prices in Kochi are appreciating at a tremendous pace. The average appreciation of property in Cochin or Kochi over the last 10 years has been over 10% compounded annually. When you take a loan, the interest you are paying for the loan, is more than the interest rates on Fixed Deposits. As an example, say the flat costs Rs.50 lakhs (Rupees 5 Million) and the Bank fixed deposit (FD) rate per year is 8%, the interest on 50 lakhs on FD at 8% works out to Rs.4 lakhs per year or Rs. 33,333- per month. So if you take a loan of Rs.50 lakhs, you will be paying for just the interest part on the loan at about 10% which works out to Rs.41,666- per month. So in case you are considering to rent the flat, make sure that you choose a good locality where you will get good rents. The investment in your flat will keep on appreciating and once the burden of the EMI is over your rental income will get better as the years go by. Many Keralites, especially NRIs are not sure where to invest their money. Many of them choose to invest in apartments or flats as investment and buy more than one flat in Kerala as an investment. This is a good idea since you can get rental income and at the same time the value of investment is appreciating. Investing in shares of good companies is is also a good idea as we explain below. To invest in the share market first learn how stock market works in India and look for the best Companies to invest in India with long term prospects. Many get scared when the word share market is mentioned. The thing to understand is that the share value of good companies keep on rising as the years go by. There are instances when the stock market crashes, but these crashes are temporary and the stock market index will start rising again and become more valuable than before the crash. The best known stock market gauge in India is the SENSEX or the S & P BSE SENSEX (Standard & Poor Bombay Stock Exchange Sensitive Index). The SENSEX index is a value calculated by assigning weightage to companies and adding the share values of 30 leading best companies in India who are judged to be well managed and stable. Today the SENSEX is at its historical high of over 28,000. 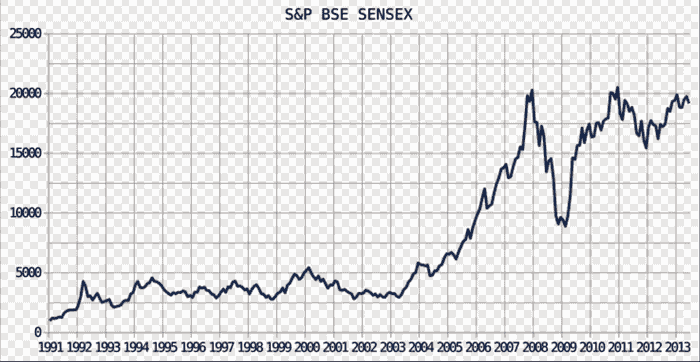 The graph below shows the rise of the SENSEX from 1991 and the table below has the actual values of the SENSEX during the same period up until end of June 2014. The graph is only till the end of the first half of 2014, there would have been a big jump in the graph line if the line wre drawn for the second half of 2014, when the SENSEX value was hovering around 28,000. On 22 January 2015 the SENSEX crossed 29,000 and soon the SENSEX is expected to go past 30,000. The days ahead are good for the stock market in India. The lesson learnt is that there are periodic crashes in the stock market, which at the time of the crash is catastrophic, and makes world headlines. This leads to the many people to beleive that investing in stock or share market is very risky and better avoided. After the stock markets falls, it comes back with a bang within a year or two. This is not world headlines like when there is a fall. So there is always this tendency in news reporting to shout about negative news, but is silent when the times are good. The SENSEX will always rise and surpass the highest values that were prevalent before any crash. The first of the famous crashes of the BSE SENSEX was in 1992 when the Big Bull of those days, Mr. Harshad Mehta, unleashed the biggest scam of all in the nascent SENSEX's history. In the year 1992 the SENSEX more than doubled from around 2,000 in January 1992 to a high of 4,462 and crashed to a low of 2,529 in August, 1992. It was a traumatic experience at that time for those who had invested in the stock market, this author included. But as can be seen from the graph and table below, the SENSEX recovered this blow and continued to rise over the years. The next big crisis of the SENSEX was in 2008 when the world markets crashed. In 2008 the high and low of the SENSEX was 21,206 and 7,697. This was a very critical year for the economies all over the world, but as you can see the SENSEX recovered even from this global crisis, and is today in 2015 at its highest peak of over 29,000. You can expect the SENSEX to continue to rise over the years. Those who lose money in the share market are those on the lookout for a quick buck, but the slow and steady investors in the share or stock market always make money. Investing in shares can be done in small amounts or large amounts, whenever you have some spare cash. Unlike buying a flat you need not take loans and burden yourself with monthly EMI payments. The best advice is to invest in shares of good Companies in India. Choose about 4 or 5 Good Companies from SENSEX 30 or the NIFTY 50 list. Choose different industries. Just as an example: SBI (State Bank of India): PSU Banking sector (PSU= public sector unit); HUL (Hindustan Unilever): FMCG sector (FMCG= fast moving consumer goods); Tata Motors: Automobile sector; ITC (Indian Tobaco Company): FMCG and hotel sector; UltraTech: Cement Sector; and so on. The trick is to buy regularly in your earning years, whenever you have some spare cash and accumulate. Buy from one of your chosen list of 4 or 5 shares whose price is down at the time you have spare cash. 2018 33,812 35,600 33,766 ??,?? ?